In late 1992, Charlton Heston traveled to Russia (heading up a cast of lesser known actors) to play (with lots of makeup!) a Mongol warlord named "Togrul" in an independently financed, $45 million historical epic titled "GENGHIS KHAN." Unfortunately, the film-makers ran out of money (!). According to Chuck, he and his makep man were probably the only ones paid. [Is this true? See Madison Motion Pictures email BELOW.) Ken Annakin [1914-2009]("The Longest Day") was the director of this then-Vision International production. UPDATE (March, 2009): HestFest receieved an email from Madison Motion Pictures stating that "Genghis Khan" is "about ready"; it is scheduled--if a distributor is readily available--to be released (hopefully) soon in different formats, according to the particular market: either as a 6-hour mini-series or a 2-hour feature film. LATEST UPDATE (December, 2010): Madison Motion Pictures recently emailed HestFest to "correct" this page's "Genghis" information and provide "additional details" on the production's final disposition. from a search on the ref. title we see that on your site there are a number of wrong information that we intend to correct and give you additional details that may help to shed more light on the incredible heroic adventure of this visionary idea of making (35 years after the last Genghis Khan - "The Conqueror” with John Wayne, shot in Utah!) a film on the life and deeds of the Great Warrior whose project started in 1992 but it has extended in time since they were shot with different Directors and several screenplays as many as 3 movies of which only the last by Annakin finally has been completed. The Production started in Kyrgyzstan by original Russian Director Tolomush Okeyev but after several weeks of shooting and a lot of money spent in project development, preparation and pre-production the film was stopped since became clear that was not suitable for an international audience. The film was started in Kyrgyzstan near Mongolia border, but unfortunately because of the Coup, that dissolved the former Soviet Union and gunfire against the Parliament in Moscow, was ordered by the Embassies to re-enter immediately the children actors and so the film stopped with a further loss of money. Despite all these odd happenings the Production started again this time under the American Director Ken Annakin ("The Longest Day" Oscar nominee) with American actors (including your legendary Charlton Heston), new story, new locations in Kyrgyzstan, Mongolia, China and Uzbekistan and finally with 4 super 35 cameras, the best professionals of international cinema (Peter Murton "King Kong"; "Superman II" Production Designer, Anthony Dawson “Killer Fish” Second Unit Director, Ugo Pericoli "The Last Emperor" Costume Designer, John Cabrera "Conan the Barbarian" Photography Director and many other…), an international crew of several hundred people, thousands of extras a multitude of horses, war machines of the time (did in purpose-built factories on the spot) were shot about 160,000 meters film in stunning views of historic sites where events occurred. At that point of course the budget was largely exceeded, there was another stop and wasn’t possible to resume the work until years later when a strong investment from Madison Motion Pictures allowed to complete some missing scenes of China assault and carried on the post-production of a 2 hours movie and 6 hours TV-series, whose the only assembling and installation of 160,000 meters of film lasted over one year by editors of value including Roberto Silvi ("Twister", "Leviathan", "Tombstone"). 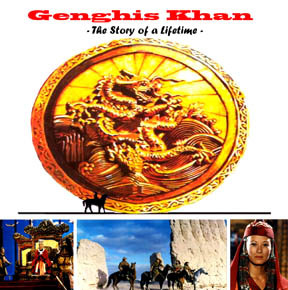 Genghis Khan The story of a Lifetime is a true Colossal on the life and deeds of the Great Warrior, with American Director and actors in the best tradition of great American cinema whose success in the world has built the film industry scoring an entire century. In fact, this Colossal is incomparable with others Genghis Khan movies because their too low production value and ethnic main actors were unacceptable from international audience. make some battle scenes in 3-D, just unthinkable before. 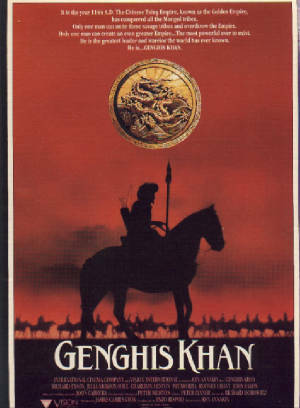 IMDB Listing for "Genghis Khan"
According to a recently resurfaced interview in Fantastic Films, Charlton Heston was offered--in the late 1970s--the lead (as The Commander?) 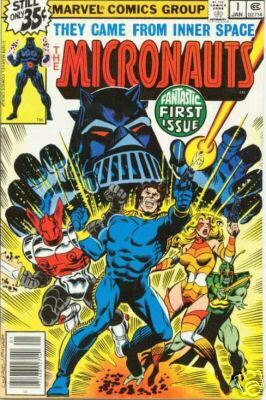 in a film version of a furturistic action figure line/comic book series known as "The Micronauts." Explaining that "there was nothing to act in it," he turned the role down, and the film was never made.